All is consciousness vibrating at different frequencies. The universe is a spectrum of consciousness, ranging from unconscious matter at the lower frequencies, through to semiconscious states and finally, at the pinnacle, at the level of infinite frequency is pure consciousness, the being of beings. 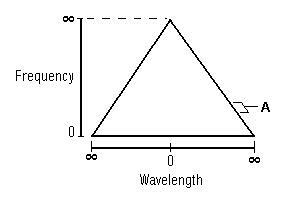 On the diagram above of the frequency triangle the section labled A symbolizes the aproximate frequency range that modern day scientists can detect with their material instruments. What is the highest frequency that modern day instruments can detect? Is there a theoretical limit? Just as the scientists now agree that matter is in itself illusory and is actually an interplay of energies vibrating, eventually they will agree that all is consciousness. Thus Science and Mysticism will unite.